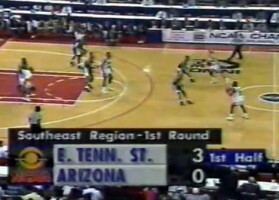 Perhaps one of the biggest wins of ETSU basketball history came in the 1992 NCAA tournament when the Bucs faced Arizona in the first round. ETSU shot extremely well in this game, hitting a total of 13 3-point shots. It’s one of the most impressive wins a 14th seed has ever had over a 3rd seed in NCAA tournament history. See more ETSU basketball games in the video section.